I, too, am a fan of "Dr. Who" and I'm a registered member of the "Dr. Who Fan Club." 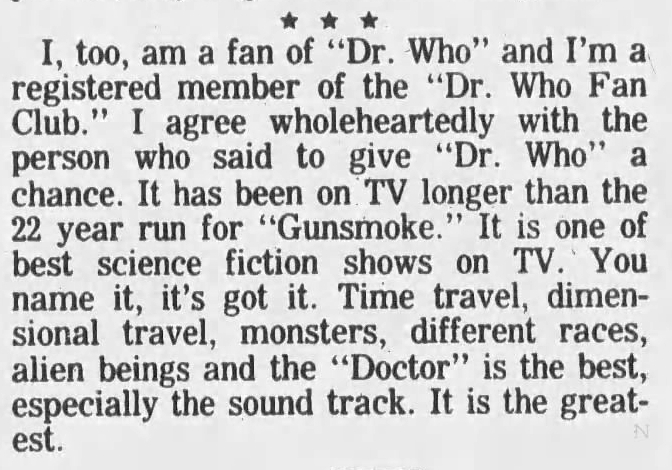 I agree wholeheartedly with the person who said to give "Dr. Who" a chance. It has been on TV longer than the 22 year run for "Gunsmoke." It is one of best science fiction shows on TV. You name it, it's got it. Time travel, dimensional travel, monsters, different races, alien beings and the "Doctor" is the best, especially the sound track. It is the greatest. APA 6th ed. : Shull, Richard (1985-12-04). I, too, am a fan of "Dr. Who". The Paducah Sun p. Extra, p. 19. MLA 7th ed. : Shull, Richard. "I, too, am a fan of "Dr. Who"." The Paducah Sun [add city] 1985-12-04, Extra, p. 19. Print. Turabian: Shull, Richard. "I, too, am a fan of "Dr. Who"." The Paducah Sun, 1985-12-04, section, Extra, p. 19 edition. This page was last modified on 1 April 2019, at 02:25.